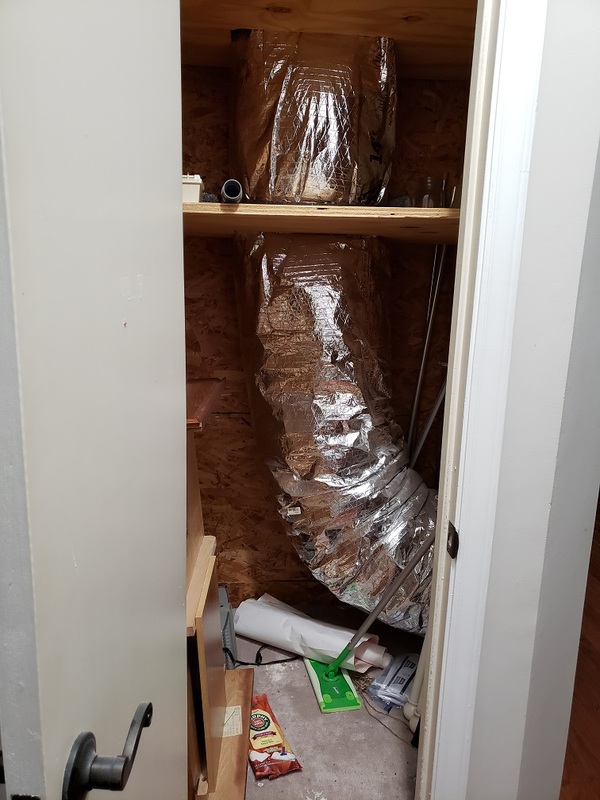 There is a closet in my house that only has a return air duct in it, see picture below. I think the A/C used to be in this closet before it was moved to the attic. I have two returns, one in the ceiling that is 14x20 and a 20x20 one in the picture below that is attached to the duct in the closet. I'd like to move the return higher up the wall so I can make the closet more usable. The house is a 1550 sqft ranch. Does moving the return look like a good idea? They are using the stud bay so leave the vent there and move the duct up high inside. Then you havn't changed anything. Do you mean moving the return vent up high like in my picture with the arrow is OK? Right now air goes in the vent up inside the wall to where the duct is, if you move the duct up just in in inside of the closet, the air just has to go further inside the wall. leave the vent grill what it is. Right now the duct is attached to the studs directly behind the vent grill. So I would move the duct with its adapter higher up the wall, close the existing hole, and use the space between the studs as the duct from the vent to the new place where the round duct is. Correct? Yes there may be a 2x4 block in the middle that you would have to remove. Thank you, that is a great solution that will free up a lot of space! The studs are 20" apart so that gives me about 70 square inches of "duct" surface area. The existing duct is 12" diameter, so about 113 square inches. That is about 40% reduction. Will this be OK for about 6 feet? Since this return air vent is used more for AC then heat, the higher location is actually beneficial. A return air vent near the floor for AC pulls the coolest air near the floor, where a high vent would pull the cool air up to circulate it better. Usually not a good idea to reduce return air flow. Won't get enough air through the stud cavity. The register needs to be moved up, if the OP wants his A/C and heat to work near properly. When posting in certain forums, knowing your location will help others give better feedback/advice/solutions to your questions. Then take the drywall off the inside that closet and add anther 2x4 wall and thacavity is 7" deep and he has a usable closet. Easier to just move the register up along with the duct. A 7x14 cavity is not equal to a 20x20 return filter grille. Neal your idea would work, but it is not ideal. By the time you do all the carpentry in the closet, it wood have been easier just to move the grill. Doing so shortens the trunk line, your method increases it and and will add turbulence and resistance. I guess the conclusion is that it is OK to move the register as I indicated in the picture in my original post. I understand is not OK to reduce the duct size. I like the idea of keeping the register where it is because it saves me drywall and painting work so if I can find a way to create a big enough duct space in the wall I might go that way. As an alternative I can also put the register in the wall above the closet or in the ceiling in front of the closet. About 480 CFM with flex at .05” static, or 525 CFM with round metal at .06”.